We work on a few different areas from basic RNA biology to cancer research and development of new technologies. Our project often span more than one of these areas and usually require an interdisciplinary team. 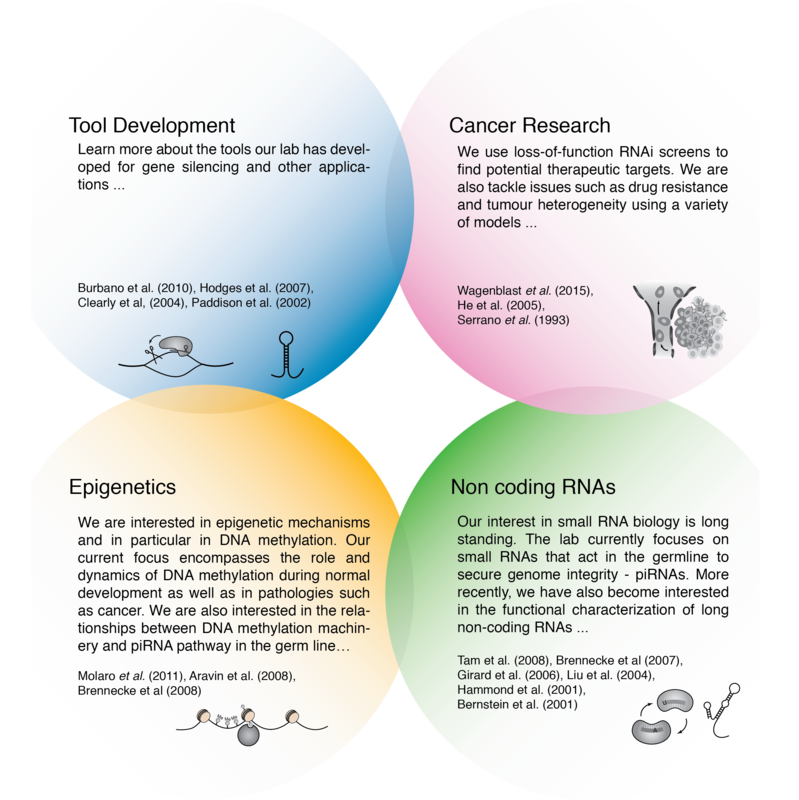 Please click on the different areas to learn more about any of the topics: Tool development, Cancer Research, Non-coding RNAs and Epigenetics. Serrano, M.*, Hannon, G.J. *, and Beach, D. (1993). A new regulatory motif in cell-cycle control causing specific inhibition of cyclin D/CDK4. Nature 366, 704-707. Bernstein, E., Caudy, A.A., Hammond, S.M., and Hannon, G.J. * (2001). Role for a bidentate ribonuclease in the initiation step of RNA interference. Nature 409, 363-366. Hammond, S.M., Boettcher, S., Caudy, A.A., Kobayashi, R., and Hannon, G.J. * (2001). Argonaute2, a link between genetic and biochemical analyses of RNAi. Science 293, 1146-1150. Cleary, M.A., Kilian, K., Wang, Y., Bradshaw, J., Cavet, G., Ge, W., Kulkarni, A., Paddison, P.J., Chang, K., Sheth, N., Leproust, E., Coffey, E.M., Burchard, J., McCombie, W.R., Linsley, P., and Hannon, G.J. * (2004). Production of complex nucleic acid libraries using highly parallel in situ oligonucleotide synthesis. Nature Methods 1, 241-248. Liu, J., Carmell, M.A., Rivas, F.V., Marsden, C.G., Thomson, J.M., Song, J.J., Hammond, S.M., Joshua-Tor, L., and Hannon, G.J. * (2004). ). Argonaute2 is the catalytic engine of mammalian RNAi. Science 305, 1437-1441. He, L., Thomson, J.M., Hemann, M.T., Hernando-Monge, E., Mu, D., Goodson, S., Powers, S., Cordon-Cardo, C., Lowe, S.W., Hannon, G.J. *, and Hammond, S.M. * (2005). A microRNA polycistron as a potential human oncogene. Nature 435, 828-833. Girard, A., Sachidanandam, R., Hannon, G.J. *, and Carmell, M.A. (2006). A germline-specific class of small RNAs binds mammalian Piwi proteins. Nature 442, 199-202. Brennecke, J., Aravin, A.A., Stark, A., Dus, M., Kellis, M., Sachidanandam, R., and Hannon, G.J. * (2007). Discrete small RNA-generating loci as master regulators of transposon activity in Drosophila. Cell 128, 1089-1103. Aravin, A.A., Sachidanandam, R., Bourc’his, D., Schaefer, C., Pezic, D., Toth, K.F., Bestor, T., and Hannon, G.J. * (2008). A piRNA pathway primed by individual transposons is linked to de novo DNA methylation in mice. Mol Cell 31, 785-799. Wagenblast E., Soto M., Gutiérrez-Ángel S., Hartl C.A., Gable A.L., Maceli A.R., Erard N., Williams A.M., Kim S.Y., Dickopf S., Harrell J.C., Smith A.D., Perou C.M., Wilkinson J.E., Hannon G.J. *, Knott S.R. A model of breast cancer heterogeneity reveals vascular mimicry as a driver of metastasis. Nature 520, 358-362.